Saturday, Pam and I got together to cut out the dress. Prior to this, we decided that coupon I have for a free banana pudding shake at Chick-Fil-A needed to be used. Chick-Fil-A has a dedicated following. I am neutral about them. There was one in a mall in Cedar Rapids so I do know who they are. And I have seen their very funny, "Eat More Chicken", commercials. I had not gone to the Chick-Fil-A in Wheaton. I don't know how long it's been open but it's not near my normal or even abnormal route, so I had never been there. Actually, until the card came in the mail, I didn't even know where it was.This was the perfect opportunity to investigate this place. 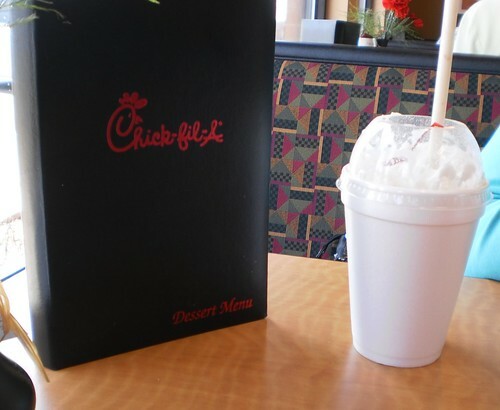 I had chicken strips and the banana pudding shake of which I had the coupon. There it is and it was very good. It tasted just as I imagined it would. There were small chunks of banana and of 'Nilla wafers in it. The whipped cream was sturdy and held up over half of the shake. Sometimes, the whipped cream topping deflates before you've consumed a quarter of your shake. This tasted just like banana pudding. Chick-Fil-A has employees wandering around, bussing tables, retrieving refills, asking how things are. Cindy stopped by our table and when I said I had the banana shake, replied, "I like to put hot fudge in it. Then it tastes like a banana split." She then hurried off to return with hot fudge for my shake. Of course it was good. I'll put hot fudge on most anything and adding it to the shake made the shake twice as good. The only drawback is that it's so rich, a large would bee too much. Seriously. This is a medium. The strips were juicy, not dried as some strips can be. They were also fresh from the fryer and were too hot to eat for about 5 minutes. They had a nice flavor and the waffle fries were good, if a touch soggy. Plus, we ate for around $8.50. It would have been closer to $10 had I not had the free shake coupon. Bottom line. I'd go there again if I found myself down that way and needing lunch or dinner.